Community-based renewable energy generation provides solutions and benefits for communities worldwide of all economic, social and geographic backgrounds. The success of such projects in addressing local needs stems from their very nature: Local people, local needs, local solutions! Let me back this argument by telling you the story of two very small rural villages in Turkey. Both villages' economies are highly dependent on agriculture, they have very limited resources and are facing the danger of losing most of their populations to urban centres. Until renewable energy came along. The first story is from a village from the Midwestern city of Manisa. Its local economy entirely being built on strawberry farming, the Sorguç village lost many of its inhabitants who cannot afford to pay their water and electricity bills to larger cities with seasonal employment opportunities. 17 families have already migrated to big cities, which is highly problematic for a village of their size, and also for migrant workers who work on unsecured contracts away from their homes. The District Governor, Recep Höl, thought something can be done to overcome these social and economic troubles. He started thinking of ways to address the rising costs of electricity and water while enhancing local agricultural capacity. He found the answer in a solar-powered irrigation system. As part of the project, the village began to store water from two remote sources and transported the water to agricultural land with a solar-powered irrigation system. This way, the village expanded its cultivable land and eliminated water costs for agricultural purposes. The excess electricity generated from the 42 panels were used for local consumption. As a result, villagers no longer had to pay a cent (or kuruş in Turkey's case) for electricity either. The outcome of this project called Damlayan Güneş (Flowing Sun) is a testimony for policymakers addressing the issues of urban sprawl and local economic development: Almost half of the people who left the village have returned and the agricultural yield has become larger and more stable than ever. This takes us to our second village and second success story. The inhabitants of the 110-household Akbıyık village in the Northwestern city of Bursa could no longer pay their electricity bills and were cut off from the grid. As they obtained their water through the use of an electricity pump, they were left with no water. 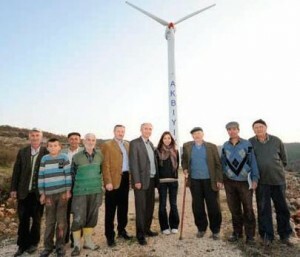 The Village Headman, Mustafa Çiçek, co-operated with its fellow villagers to come up with their own action plan: They were going to install a windmill to generate their own electricity. The 160,000 Turkish Lira (around 80,000 USD) project was funded by the City of Bursa and has been generating electricity for 2 years. Hi Yeruva -I completely agree that it is a very pressing need, especially in jurisdictions facing power cuts and blackouts. I also believe that spreading the word about such initiatives can serve to press policymakers to prioritize community-based renewable energy generation. Hi Rituu! Thank you and looking forward to getting in touch with them as well! This is the most pressing need. India especially the rural India is facing huge power cuts. I visited Kadirimanagalam village in Nagapattana district in Tamilnadu, India recently during the Global Learning Festival. The farmers shared their voes of power cuts and how it affects their agriculture. I did share how the farmers in Andhra Pradesh generated power through solar panels. I wish SIAAP your story to the young people of Kadirimangalam village. Because I could recall youngster being inspired when I shared similar story with them. I wish solar and wind power generation is highly subsidized for farmers to encourage such powerful local response. Thanks Derya for posting these stories of community action in Turkey. I have three new friends from Turkey here and will share with them and many others.